Blog about Web development, SEO, Online business, Software Testing and Tech News. 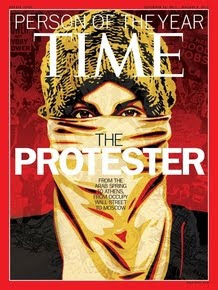 This Year (2011), the TIME magazine is awarding "the person of the year" title to "The Protestor" i-e to everyday people who changed the Arab world’s political landscape. It was just announced on NBC-TV's The Today Show and on Time's website. TIME magazine says the protesters representing Occupy Wall Street, Occupy Oakland, Occupy the Hood, the Indignados of Spain, protesters in Greece, revolutionaries in Tunisia and Egypt, activists from Syria fleeing persecution, a crusader fighting corruption in India, Tea Party activists from New York, a renowned poet-turned-protestor from Mexico, and a protestor from Wisconsin who carries a shovel, topped by a flag. TIME says Social Media didn't cause the movements, but Human did it. The protests have marked the rise of a new generation. In Egypt 60% of the population is under the age of 25. Technology mattered, but this was not a technological revolution. Social networks did not cause these movements, but they kept them alive and connected. Technology allowed us to watch, and it spread the virus of protest, but this was not a wired revolution; it was a human one, of hearts and minds, the oldest technology of all. Reason for choosing "The Protestor"
"For capturing and highlighting a global sense of restless promise, for upending governments and conventional wisdom, for combining the oldest of techniques with the newest of technologies to shine a light on human dignity and, finally, for steering the planet on a more democratic though sometimes more dangerous path for the 21st century, the Protester is Time's 2011 Person of the Year," Time editor Richard Stengel says in a statement . Last year (2010), Facebook founder and CEO Mark Zuckerberg got the Person of the Year award. You can subscribe to our Email posts, and you can bookmark this blog for further reading, or you can subscribe to our blog feed. The Protestor does deserve to be the person of the year!! Each one of them! Basic Computer Hardware Quiz Questions and Answer. Opportunity for YouTubers to increase their Earnings. The 4 Things Every Entrepreneur should Follow. How to Improve Web Page loading Performance? Top 5 reasons for buying our Time Sheet Application. Read latest news about Emerging Technologies, like, 3D Printing , NanoTechnology, Robotics and Gene Editing. Get Quotes for Motivating and Inspiring everyone. You can get both text Quotes and Image Quotes.